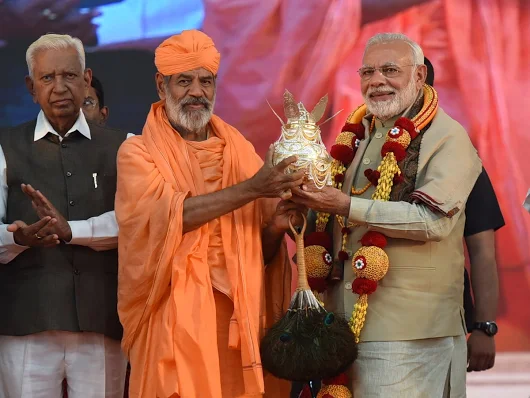 PM Modi joins the Bahubali Mahamasthakabhisheka Mahotsava at Shravanabelagola in Karnataka and said "Saints and seers from our land have always served society and made a positive difference." The scion of Mysuru Royal family Yaduveer Wadiyar participated in the grand anointing ceremony in Shravanabelagola. More details are given below. 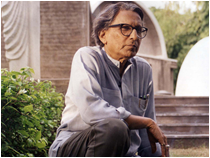 Congratulations to Balkrishna Doshi for wining 2018 Pritzker Prize. Q 1: What is the name for the group of Jivas with three senses? Q 2: Can you give the examples of the three-sensed Jivas? 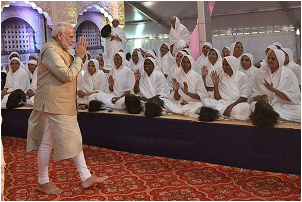 Taking advantage of a huge gathering of devotees and the presence of Jain munis and Matajis either side of the dais, Prime Minister Narendra Modi turned his speech towards religious matters saying, the strength of our society is that we have always changed with the times and adapted well to new contexts. It is our duty to provide good quality and affordable healthcare to the poor. Stressing the importance of education and health in the society, he added that people will be more active and will show interest when the religious aspects are raised but the same will be helpless and show a lack of interest when matters of social responsibilities are raised. The Pontifical Council for Interreligious Dialogue most cordially extends its festal greetings to all of you on the Birth Anniversary of Tirthankar Shri Vardhaman Mahavir which is celebrated this year on 29 March. May this commemorative occasion, besides advancing peace and enhancing happiness among you and around you, bring about a strengthening of caring relationships within your families and communities! The scion of Mysuru royal family Yaduveer Krishnadatta Chamaraja Wadiyar participated in the grand anointing ceremony atop Vindhyagiri in Shravanabelagola on Friday. He climbed up the steps and poured holy water on the Bahubali statue. The royal family has been associated with Mahamastakabhisheka for centuries. Yaduveer Wadiyar recalled how his ancestors have also participated in the event in the past and is happy to get an opportunity to take part in this ceremony. The turnout for the event on Friday was monumental. 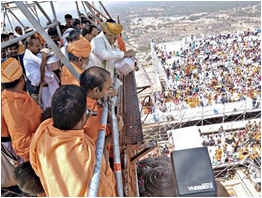 As it is scheduled to conclude on Sunday, the number of devotees visiting the place has been on the rise. The State government has made accommodation available for 26,000 people in 12 townships. Bal Krishna Doshi is the newest winner of the Pritzker Architecture Prize, known as the Nobel Prize for architects. Over the course of six decades, he has become famous in his native India as an educator who transformed practices in his field, partly by establishing several schools of architecture and design. The 90-year-old architect has built more than a hundred buildings that reflect his investment in local materials, social change and the environment. As a student and young architect himself, Doshi worked with two of the great Modernists of the 20th century: Le Corbusier and Louis Kahn. Balkrishna Doshi believes that, like life itself, architecture should be experienced with exuberance and wonder, and with an abiding sense of its endless possibilities. 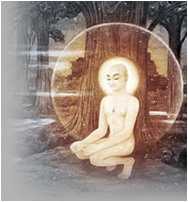 After twelve and a half years of severe austerities and intense meditation, Bhagwan Mahavira attained kevalgyan (omniscience). This auspicious event occurred on the 10th day of the bright half of the month of Vaishakh in the year 511 before the Vikram Era on the blessed banks of the river Rujuvalika, when Bhagwan Mahavira was sitting in the godohasan (the posture assumed while milking cows) when He was 42 years old. He spent the remaining 30 years of His life going from place to place, preaching the principles of Jainism to all. A divine assembly hall, called samavasaran, was constructed for His sermons. Celestial beings, humans and animals, all sat together in harmony, listening to Him with rapt attention. He categorised His followers into a four-fold order which included sadhus (monks), sadhvis(nuns), shravaks (laymen) and shravikas(laywomen). This order is known as the Chaturvidh Sangh. One day Satyavati was travelling by a train. There was a heavy rush in the train, so Satyavati closed her eyes and began to recite Namokar-Mantra. Sometime later, a woman told Satyavati, "Oh my daughter please sit on the berth". Satyavati opened her eyes and saw a lady also who was holding a child in her lap. Satyavati told her to come and sit in her place. She told the lady,"Your child is weeping, I can stand easily". "Mother why are you weeping?" The woman said that someone had stolen her five hundred rupees, which she had arranged for the treatment of her sick son. Hearing this Satyavati became restless. She decided to find out the thief. She looked into the face of each passenger, and stopped at once in front of a man. She said to him,"Oh brother, why did you steal the money of a poor lady? "How do you know that I am the thief?" She replied," I have read your face". After hearing this, the man felt ashamed and returned the five hundred rupees. From that day, the man took an oath not to steal in future.